Move over, New York. Earlier this month, developers McKnight Realty Partners held a ceremonial groundbreaking for the Highline, Pittsburgh’s newest mega-conversion. Developer McKnight Realty teamed up with local firm Indovina Associates Architects to redevelop the Pittsburgh Terminal Warehouse and Transfer Company (map) on the city’s deindustrialized South Shore. The $110 million complex will bring 600,000 square feet of office and retail to the area. The building—they are one, but appear to be two—is connected by a five-hundred-foot-long elevated roadway that will be converted into a park-like space with lighting and seating. The walkway will be extended to the abutting Monongahela River and face north towards the city’s Downtown. Similar in name and form to Manhattan’s High Line, which brought a disused freight railway line back to life as a public park and spurred a development boom on Manhattan’s Far West Side, Pittsburgh's Highline project seeks to revitalize a significant site within the city's post-industrial landscape. Indovina’s design incorporates vegetative and hardscaping features, such as raised planters and textured concrete pavers. Below the Highline, and along the facility’s loading docks, there will be a lower park dubbed the Yards which will serve as an extension to Pittsburgh’s preexisting river trail system. Restoration is key to the project. Notably, all of the complex’s damaged windows will be replaced with historically accurate units and both the cast-iron detailing and brick curtain walls will be entirely restored. Completed in 1906, The Terminal Building was designed by prominent Pittsburgh architect Charles Bickel. Like the former warehouses adjacent to Manhattan’s High Line, the facility was designed to integrate freight and warehousing logistics in an urban setting. The conversion of The Terminal Building joins Pittsburgh’s ongoing restoration and construction trend that has brought similar warehouses back to life, such as the city’s Produce Terminal and the Allegheny Riverfront Green Boulevard. The Pittsburgh Tribune reported the project will receive approximately $17.5 million in federal and state financial incentives, and construction should be complete by 2019. Thomas Heatherwick and developer Related Companies have teamed up yet again, this time for a double-pronged condo tower that wraps around a section of Manhattan’s High Line. As first reported by CityRealty, marketing materials for the Heatherwick-designed 515 West 18th Street, and the nearby 555 West 22nd Street, designed by Robert A.M. Stern Architects (RAMSA), are available via an EB-5 investor website. (EB-5 is a federal program designed to spur international investment by promising green cards in exchange for financing, or through the creation of 10 or more permanent jobs.) 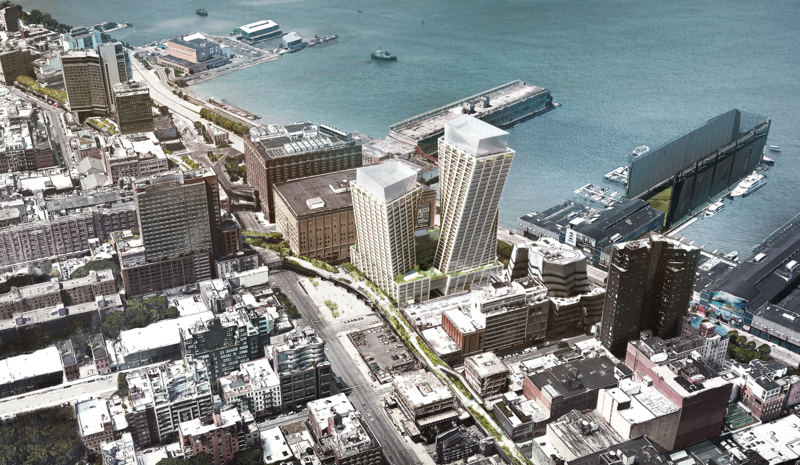 The two 18th street towers will straddle the High Line while remaining a single, connected building under the elevated rail park. The east tower will be 10 stories tall, while the west tower will be 22 stories, likely an attempt to maximize views of the neighboring Hudson River. The 425,000-square-foot development will contain 181 condos split across both towers, as well as 17,000-square feet of gallery and retail space. The most defining feature of the project are the barrel-shaped windows, which seem to balloon from within against a constraining brick frame. 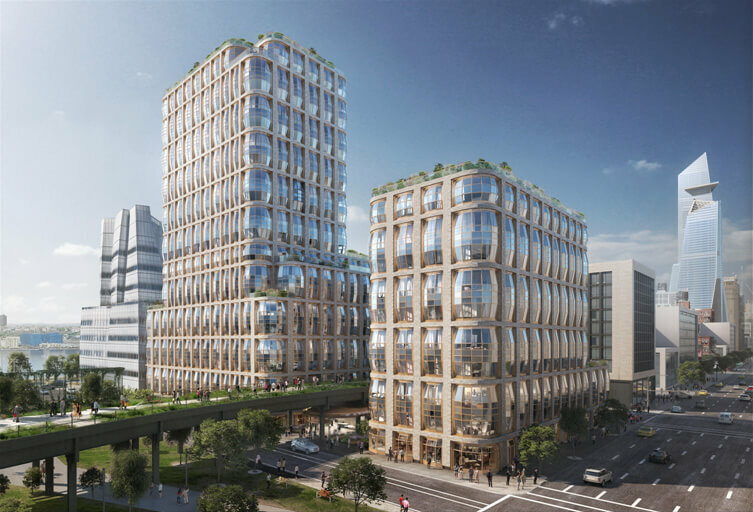 According to a Related official, the design is a “modern interpretation of the bay window.” As expected of a pricey development along the High Line, the Heatherwick's twin towers will be amenity-heavy and hold a fitness center, spa, entertainment lounges, and 175 on-site parking spots. The video walkthrough of the project seen below, including a look at the high-end interiors and amenity spaces, can also be found on the EB-5 site. ﻿ Much less is known about the second project on West 22nd Street. The boxy, brick tower designed by RAMSA will likely contain 141 condo units and many of the same amenities as its cousin on 18th Street, but Related has released fewer details on this second building. 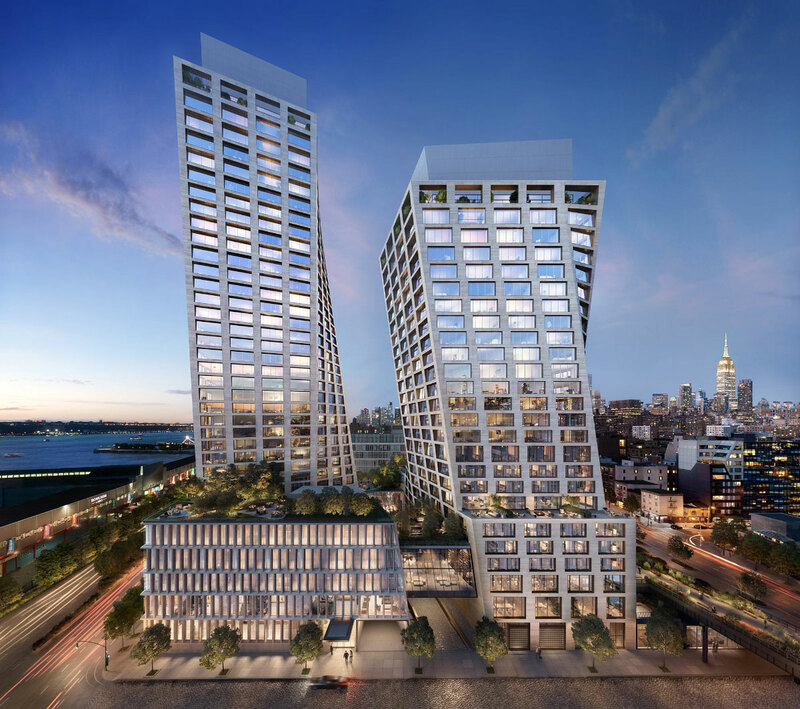 Together, both projects will form a development tentatively titled the Hudson Residences. Related expects both projects to finish in mid-2020, though neither have fully cleared the city’s approval process. As such, the renderings and information released thus far are still subject to change. Heatherwick and Related have most recently worked together on the massive Vessel sculpture in Hudson Yards, and this collaboration makes sense as Related continues to develop projects along Manhattan’s west side, including the Zaha Hadid’s 520 West 28th. AN has reached out to Related Companies for a comment on the Hudson Residences, and will update this article with more information when it becomes available. Robert Hammond, founder and executive director of the nonprofit Friends of the High Line (FHL), the organization that funds and maintains the High Line in Manhattan, recently expressed doubts about whether the park has fulfilled its original purpose. “We were from the community. We wanted to do it for the neighborhood,” said Hammond in an interview with City Lab. “Ultimately, we failed.” The article points to issues of equity and inclusivity in public space as the cause for concern. 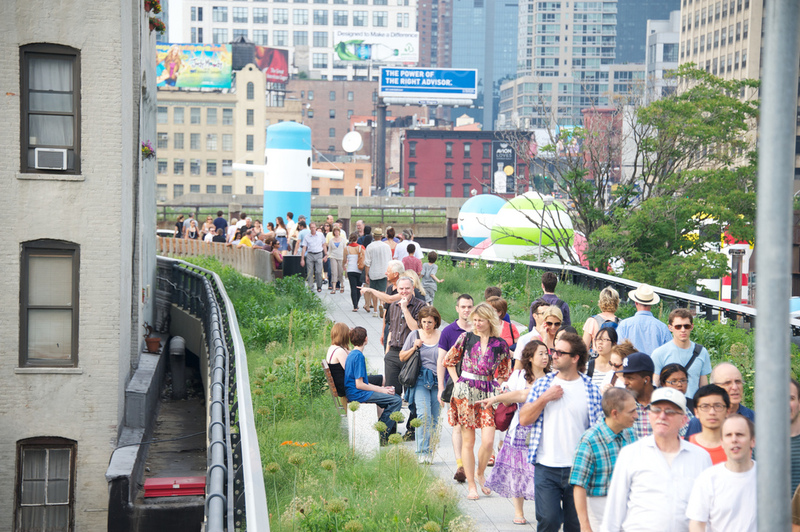 The success of the High Line has far outpaced the FHL's original estimates of 300,000 visitors a year; the linear park attracted 7.6 million visitors in 2015 alone. However, in an FHL report of the same year, the data shows that only 458,000 were from the “High Line area” and on average 45% of the visitors were nonwhite. While the report notes these numbers are much better than previous years, the question of whether the High Line has produced equitable urban space is still up for debate. Increases in real estate values due to development in the neighborhoods that touch the High Line are estimated to generate almost $1 billion dollars in tax revenues over the next 20 years. Further investigation is needed to see how those funds will directly benefit lower income residents in the area. Hammond penned a note on the FHL website saying his previous statement was truncated and “inadvertently gives the impression that I think the High Line has not been a success. That couldn't be farther from the truth or what I believe personally.” The organization has in recent years sought to broaden its coalition and recalibrate its efforts to address the issues of access to high-quality parks for diverse stakeholders. This has manifested into the creation of more public programming and the High Line Network, a coalition of designers invested in developing parks projects in other cities across the U.S. and Canada. The Network has met several times since its inception and has focused on projects like the L.A. River rehabilitation and Atlanta’s rail-to-trails Beltline. 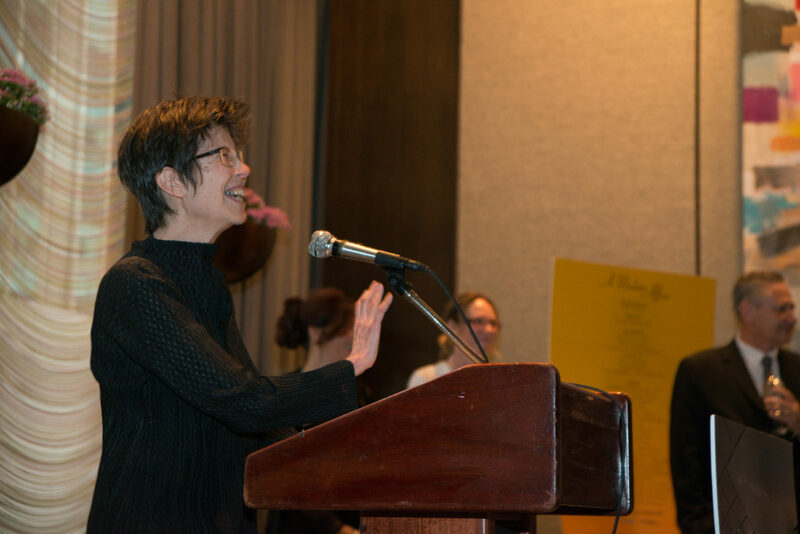 New York architect Elizabeth Diller, a founding partner at Diller Scofidio + Renfro (DS+R) is working on an opera (yes, an opera) for the High Line. The show is expected to take place in 2019 and has been appropriately coined the Mile Long Opera. Diller will be working with composer David Lang and sound designer Brude Odland for the project. Diller has been playing with the concept for some years now. According to The Real Deal, Diller said the idea took inspiration from a woman who used to put on her own self-starring cabarets on her fire escapes. Known as the Renegade Cabaret, the shows were a reaction to people who were supposedly encroaching on the privacy of a condo on West 20th Street that looked on to a park. No other information is currently known about the Mile Long Opera. Diller, though, has worked with Lang in the past. DS+R and Lang produced Musings on a Glass Box which was held at Jean Nouvel's Fondation Cartier pour l’Art Contemporain in Paris in 2014. That same year, in an interview with Surface Magazine, Diller gave a hint that an opera was in the works. "We’re working on a large-scale opera, which is really a new kind of urban project," she said. "We’re really trying to get at the gesamtkunstwerk—the total project." Diller doesn't just have musical aspirations either. Speaking to Architect Magazine also in 2014, she discussed her work with Spike Jonze for the film Her. "In college I’d had a fantasy of being a filmmaker. I’d taken film courses at Cooper Union and then somehow detoured into architecture," she said. "But the film bug never really left. If I could leave my life for five years, I would love to construct a film from scratch. The Fourth Plinth in London’s Trafalgar Square, a high-profile venue for a changing program of temporary commissioned artworks, has inspired a similar landmark destination in New York: the High Line Plinth. New York’s plinth will be a visible stage for sculpture located on the High Line's new "Spur" section at West 30th and 10th Avenue; the plinth and the Spur are scheduled to open together. High Line Art (which describes itself as "Presented by Friends of the High Line," the non-profit group that funds and maintains the famous rails-to-trails park) has said construction is expected to begin in 2017, with the opening coming sometime in 2018. According to The New York Times, the plinth will likely change shapes and sizes depending upon the artwork showcased. "High Line Art continues to reach a broad, diverse audience—including more than 2.3 million New Yorkers annually—with free, world-class artwork 365 days a year," said Robert Hammond, cofounder and executive director of Friends of the High Line, in a statement. To determine what artworks should inaugurate the plinth, 12 international artists have been shortlisted by Hight Line Art and an international advisory committee. Models of the artists' proposed sculptures will be displayed from February 9 to April 30, 2017, on the High Line at West 14th Street. Of the twelve, two will be the first High Plinth commissions. The first artwork will be installed in 2018, and each piece will be available for viewing for 18 months. The artists include Jonathan Berger, Minerva Cuevas, Jeremy Deller, Sam Durant, Charles Gaines, Lena Henke, Matthew Day Jackson, Simone Leigh, Roman Ondak, Paola Pivi, Haim Steinbach, and Cosima von Bonin. See the gallery above to sample some of their proposals. 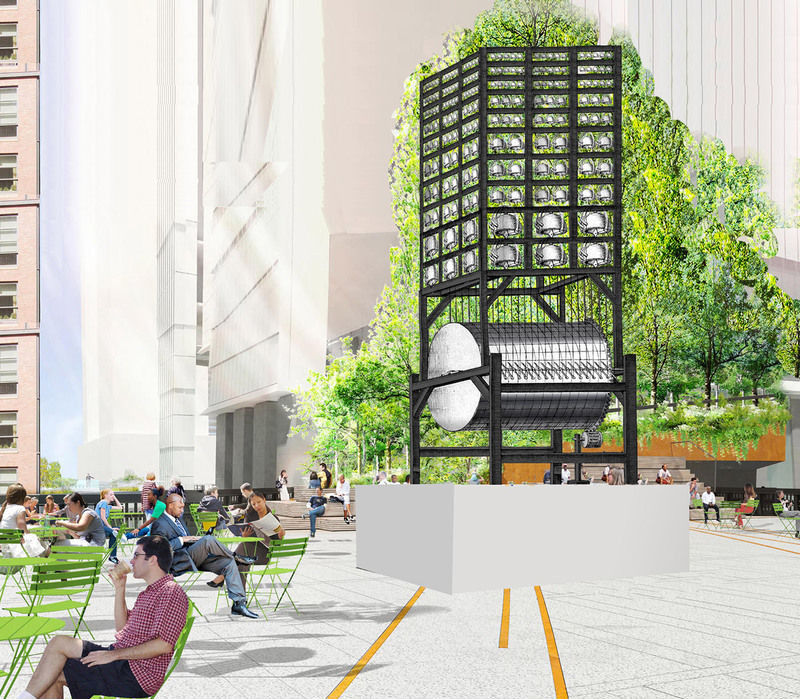 The Friends of the High Line also reported that the Spur will provide storage space for park operations, maintenance, horticulture, and new public restrooms for the park. "The High Line Plinth will expand the program's impact by creating a one-of-a-kind destination for public art on the Spur, a new section of the park with even more space for public programming and dynamic horticulture,” Hammond said. New renderings and details on Bjarke Ingels Group’s (BIG) multiuse development under construction on 76 11th Avenue along New York City’s High Line park were released yesterday. The project, dubbed “The Eleventh” will contain a five-star 137 key Six Senses hotel and spa (the company’s first in U.S. location) in the East Tower and approximately 240 luxury apartments split between the two towers, as well as retail space and a public promenade accompanying the adjacent High Line. “When we acquired the last major downtown development site in 2015 we had a blank slate to create a new neighborhood on one of the world’s most valuable and desired pieces of land,” said HFZ Capital Group chairman and founder Ziel Feldman in a press release. 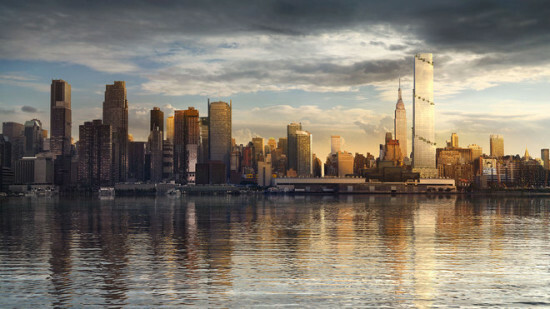 The Eleventh will consist of two towers that, at an estimated 300- and 400-feet tall, will be the tallest buildings in the West Chelsea neighborhood (the West tower will be the taller of the two), ensuring panoramic views of downtown and midtown Manhattan and the Hudson River. In addition to the 240 condominiums and hotel, taking up roughly 950,000 square feet, 90,000 square feet will be devoted to retail. 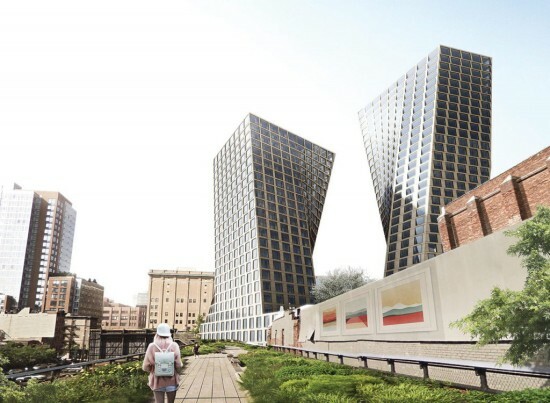 The two, twisting towers topped with glass “crowns” have a distinct BIG geometric sleekness about them that is, if not reminiscent of, then certainly complementary to the firm’s VIA 57 West and “The Spiral,” both just north along the Hudson River. According to the press release, the buildings are inspired by “New York City's classic modernist structures and cultural institutions … The punched window openings, meanwhile, are an important nod to the past, a reference to the historic industrial buildings of the neighborhood and nearby Meatpacking District.” The Eleventh joins a slew of starchitecture along the High Line, including Zaha Hadid’s West 28th Street, Neil Denari’s HL23, DS+R’s “The Shed,” and Renzo Piano’s Whitney Museum. The Eleventh is slated to open 2019. By now, the "Bilbao Effect" is metonymy for a culture-led revitalization of a postindustrial city driven by a single institution housed in a starchitect-designed complex. The wild success of Manhattan's High Line generates regional seismic effects—the Lowline, the QueensWay, and the Lowline: Bronx Edition all cite the high queen of linear parks as their inspiration. 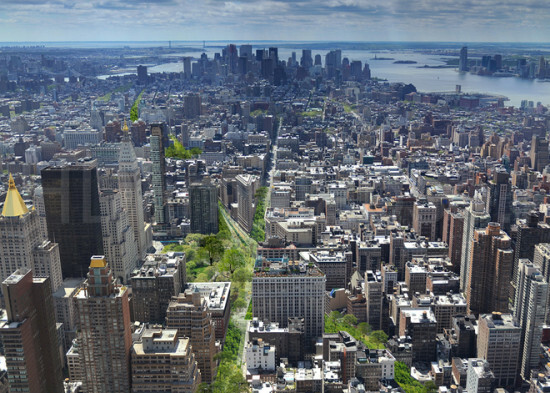 Upping the ante, Perkins Eastman unfurls the Green Line, a plan to convert one of New York's busiest streets into a park. 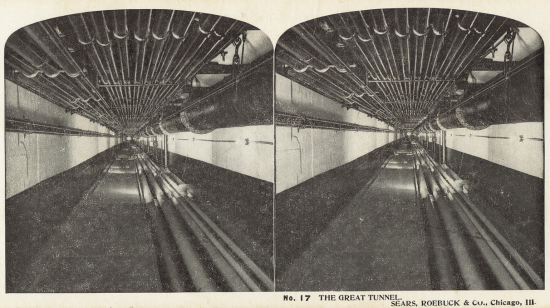 The Green Line would overtake Broadway for 40 blocks, from Columbus Circle to Union Square, connecting Columbus Circle, Times Square, Herald Square, Madison Square, and Union Square with pedestrian and cyclists' paths. Except for emergency vehicles, automobiles would be banned from the Green Line. The proposal has precedent in Bloomberg-era "rightsizing" of Broadway. Traffic calming measures closed Times Square to cars, increased the number of pedestrian-only spaces, and installed bike lanes along Broadway, reducing vehicular traffic overall. In conversation with Dezeen, Perkins Eastman principal Jonathan Cohn noted that "green public space is at a premium in the city, and proximity to it is perhaps the best single indicator of value in real estate. [The] Green Line proposes a new green recreational space that is totally integrated with the form of the city." Value, moreover, isn't linked exclusively to price per square foot. Replacing two miles of asphalt with bioswales and permeable paving could help regulate stormwater flow for the city's overburdened stormwater management infrastructure. Right now, rain falling to the west of Broadway discharges, untreated, into the Hudson, while east of Broadway, stormwater gushes straight into the Hudson. What do you think: is the Green Line on Broadway feasible, or totally fantastical?